Will the Green Line Extension make Somerville real estate go crazy? When the Green Line and another T project are completed, 85 percent of Somerville will be within a half-mile of a transit center, up from the current 15 percent. 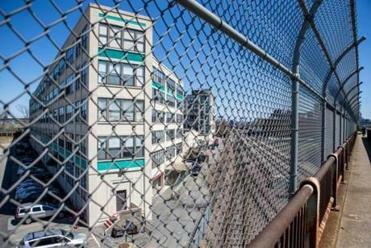 THE LISTING FOR an early spring open house promised a third-floor Brickbottom loft in Somerville with a view of the Prudential Tower. But as prospective buyers toured the unit in the industrial building-turned-condos on a raw, rainy Sunday afternoon, clouds obscured the Boston skyline. Instead, a wall of large windows framed nearby train tracks and the McGrath Highway overpass. The gray, gritty panorama didn’t diminish interest in the loft priced at $430,000. Far from it. Serious customers came with their pre-approved mortgages. Young couples. Singles with parents in tow. Investors. They saw, they admired the hardwood floors, they commented on the loft’s only bathroom beside the kitchen, they imagined how they would convert the wide-open, 1,519-square-foot space into comfortable living quarters, and they lingered in front of the windows. For many checking out the loft, the train tracks were more valuable than a view of the Pru. If all goes as planned, Green Line trains will start chugging along the same route in 2017 with a stop designated for Brickbottom. Would-be buyers are betting rumbling subway trains will translate into real estate ka-ching down the line. The next day, realtor Louise Olson received three offers on the loft, including one with a personal note for the seller. The note writers, Eric Woods and his girlfriend, Bonnie Le, mentioned the appeal of the artist-friendly Brickbottom area, the bustle of nearby Union Square, and their excitement about the Green Line Extension. Having made offers on two other properties in the area, including another Brickbottom loft, and having been knocked around and out by bidding wars, the couple hoped their note and offer of $451,000, $21,000 above asking, would give them the advantage. It worked, and Woods, 26, and Le, 24, move in at the end of May. When it comes to Somerville real estate these days, one way or another, people expect a bit of a ride. With 30 years of experience doing deals in Somerville and Cambridge, Olson wasn’t surprised that the planned subway made the property more enticing and that it took an offer substantially above asking to beat out the competition. “There are a lot of people who are speculating that the values are only going to go up as the Green Line Extension comes through and Union Square develops further,” she says. When the extension is completed with six new stops (and an Assembly Square station is added to the Orange Line this fall), 85 percent of Somerville will be within a half-mile of a transit center, up from the current 15 percent. Perfect for the brave new Walk Scoring, bike-sharing world we live in. “A lot of younger professionals see cars more as a burden than a privilege,” says Woods, who works in Cambridge for the car-swapping company RelayRides. Union Square Station, due in early 2017, will be the lone stop on a short spur that connects to Lechmere. Meanwhile, the main branch will add five new stops and parallel the MBTA’s Lowell Commuter Line, running from Lechmere to College Avenue in Medford. The first stop on the main branch, Washington Street/Brickbottom, also is projected to debut in early 2017. 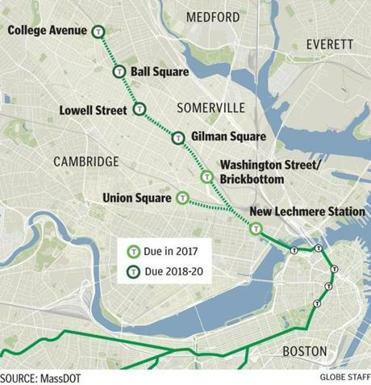 The remaining stations — Gilman Square, Lowell Street, Ball Square, and College Avenue — are slated to open in 2018-20. Longer-term plans envision a seventh station near Route 16 in Medford. All subway cars on the route will travel above ground. After losing out in other bidding wars, Bonnie Le and Eric Woods offered $21,000 above asking price to win a Brickbottom loft in Somerville. A report from the Metropolitan Area Planning Council predicts property values within walking distance of new Green Line stops will increase anywhere from 16 percent to 25 percent in the next couple decades, similar to the appreciation along the Red Line Extension to Alewife in the mid-1980s. Rents could rise 67 percent over the same period, with the sharpest increases in Union and Ball squares and Brickbottom. The report also predicts property taxes will jump for homes within a half mile of T stations. Nearly 70 percent of Somerville residents rent, and city officials are particularly concerned about the impact on lower-income renters. Those in City Hall have studied reams of property data, looking closely at turnover rates and displacement. “As the Green Line physically hits the ground, we need to follow these data points and make sure they’re not taking a turn we’re uncomfortable with,” says Dana LeWinter, Somerville’s director of housing. She highlights the city’s goal of adding 6,000 new housing units by 2030, 1,200 of them affordable, to help offset the gentrification predicted to come with the Green Line. West Medford prices are rising, too, though not as quickly or steeply as Somerville values. With more buyers priced out of Cambridge, Somerville, and even Arlington, some realtors suspect Medford increases may be more related to a trickle-over effect than the extension. 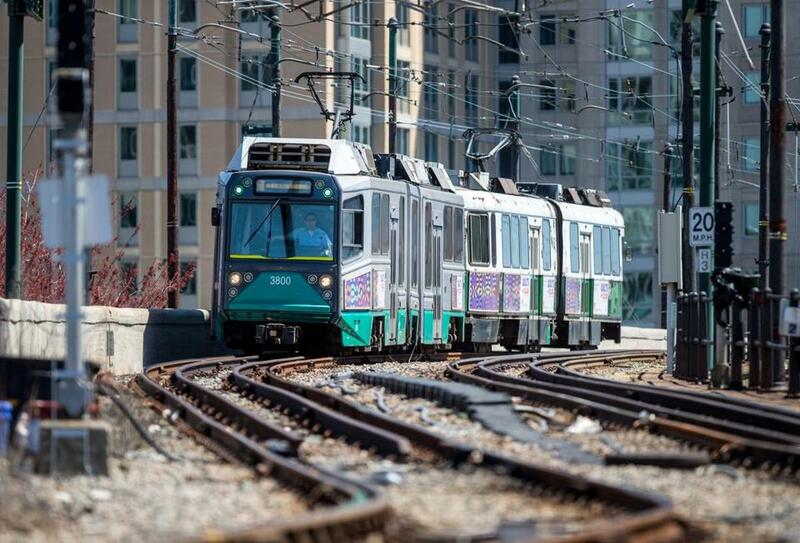 The new Green Line stops mark the first MBTA rail line expansion in almost 30 years. The last major changes to the area’s subway system came when the Red Line Extension to Alewife opened in May 1985 and the rerouted Orange Line between New England Medical Center and Forest Hills debuted in May 1987. Other planned expansions, such as the Red Line from Alewife to Lexington, were abandoned, in large part because of community objections. Then as now, rail extensions come with hopes and fears about their impact on residential real estate and quality of life. Investments in public transit aim to serve everybody, but even with the best-laid plans, improvements often favor those with the fattest wallets. HOMEOWNERS ALONG the new Green Line will likely be living in the urban equivalent of a gold coast. “Homes that are along beachfronts and now more and more homes along high-frequency transit corridors are subject to less volatility when the market fluctuates,” says Michael Melaniphy, president and CEO of the American Public Transportation Association. Citing a report by his group and the National Association of Realtors, Melaniphy explains: “In the time period between 2008 and 2013, when there were depressed housing prices, homes that were near high-frequency transit corridors didn’t lose their value as much as others did. When the market started to rebound, they rebounded more quickly. The impact overall was much like it would be if you have beachfront property.” The report, which studied residential property values in five US cities, also found that homes in Greater Boston were the most resilient of all. Properties near public transportation outperformed other properties in the region by nearly 130 percent. “People see the Green Line as value added to their property and to their neighborhood,” says realtor Lisa Drapkin. In Somerville, typical home prices are already substantially above the state average. The median single-family home price was $540,000 for Somerville and $320,000 for Massachusetts in 2013, according to The Warren Group, a Boston-based real estate tracking firm. When it came to condos in 2013, the median price was $409,500 for Somerville and $296,000 for Massachusetts. Already Union Square can boast of its first $1 million single-family home sale and prices that soar past $500 per square foot. For what the future may hold, would-be buyers need look no further than Davis Square, the biggest beneficiary of the Red Line Extension. Before the Red Line stop opened in December 1984, Davis Square was neglected and run-down. Afterward, interest in the area surged, drawing in new residents, restaurants, bars, shops, and housing. Davis Square now claims many of the highest-priced properties in Somerville. When asked about the potential of steeper rents and home prices driving away some residents, Mayor Joe Curtatone says: “As we prosper and that tide of prosperity rises, we want that to raise all boats. We don’t want to lose our soul. We want that creative, original, diverse, that sort of funky, freaky mix of who we are.” He views the Green Line Extension as an opportunity to alleviate poverty, connecting lower-income residents with jobs, schools, and health care. While the Green Line is certainly generating excitement in the mayor’s office and beyond, past delays still haunt the project. Until Phase 1 construction started in December 2012, many Somerville residents doubted the extension would ever come. Some of that skepticism remains. A listing for a two-bedroom property on Lowell Street touts proximity to a planned T stop, then concludes: “New proposed Green Line station scheduled to open up in the next four years or so.” Buyers with shorter time horizons should consider that fair warning. Real estate agent Scott Miller, who’s been working in the Somerville market for a decade, often gets asked when certain stops will open. “I can’t give them a straight answer,” he says. “I think the delays are having more of an impact than you would think.” Having recently sold seven condos in a new development at 129 Highland Avenue, where the listing trumpeted its walkability to the planned Union Square and Gilman stops, Miller believes that Union Square properties may be the one example where the Green Line is truly influencing prices. Condos make up most of Somerville’s inventory, and the average stay in a condo is four to seven years, according to realtor Thalia Tringo. “If you say something is coming down the pike in four or five years, they could be gone by then,” she says. “It’s not very meaningful for them, and it’s not concrete enough for them to make investments.” And the legacy of the Big Dig lives on. People tend to be cynical about the delivery dates of transportation projects, especially in Greater Boston. Another improvement in the works is a pathway for walkers, runners, and cyclists that will connect the Alewife T Station to Lechmere, paralleling parts of the Green Line. Then there is the empty lot in the Brickbottom area that once housed a foul-smelling, rodent-attracting trash transfer station. Last fall, the city demolished it, and someday the space may be an urban park. Before making their offer, Woods and Le, the Brickbottom buyers, were happy to learn about the demise of the transfer station and the plans for the community path and McGrath Highway. “What the Green Line is doing to the area excites us most,” says Woods, wondering about what might be next. With room to grow in their new loft, Woods and Le are prepared to stay 10 years, maybe more. Waiting is a trait that has served other Somerville homeowners well. There are the lucky ones who invested in properties near the Green Line Extension back when it seemed more rumor than reality. Olson has clients who purchased a single-family home near Union Square and renovated it, then moved to the suburbs and debated whether to sell in 2009. They rented it out instead. But now they are again considering selling. In 2009, Olson and her clients discussed values under $800,000. Now they are talking $950,000 to $1 million. Local realtors are noticing that more and more Somerville homeowners, particularly in Union Square, are holding onto their properties when they upsize to their next home, renting out the original place and waiting to see how high prices will go. The practice is contributing to an already tight market. One couple doing just this paid $249,000 for a two-bedroom condo in Union Square in 2001. They graduated to a single-family home near Davis Square last year but kept their Union Square property. Based on similar units in the area, the couple’s Union Square investment may now be worth around $500,000. The only danger to this approach, a few realtors say, is that a number of properties could flood the market at the same time, close to the Green Line’s arrival, and water down values. The extension’s delayed start and long-anticipated impact make for a lot of guessing and gambling. Many in Somerville believe the Green Line will move the city toward a more prosperous future, forever shedding its “Slummerville”-tagged past. But with all the real estate jockeying, one thing is clear: When the trains finally arrive, not everyone will be able to enjoy the ride.